Since we have only one location we can indeed say all our Ice Creams are made on the premises in small batches. We use only the finest ingredients available and hand fold in the mix-ins such as chocolate chips, nuts and fruit. 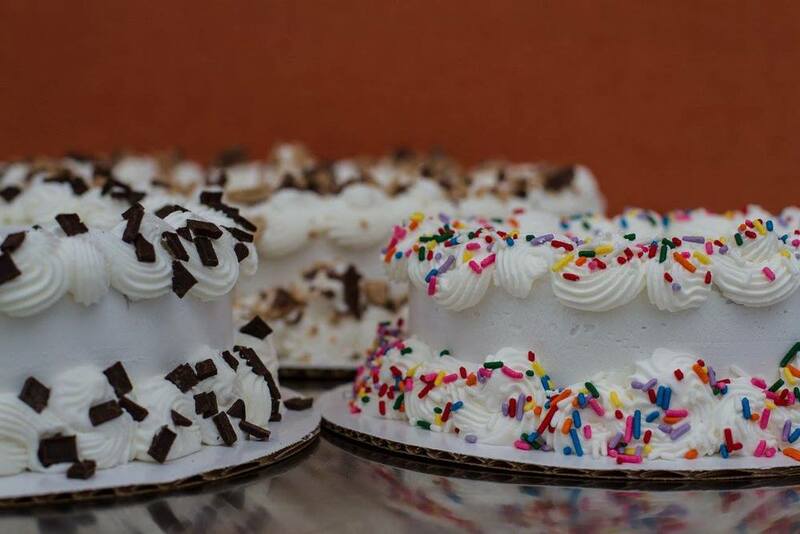 We use fresh milk and cream, with a high butterfat content that allows the flavor to come to the front. The final product is creamy and smooth and full of flavor. We keep a core palette of flavors and constantly supplement with limited addition flavors that are either seasonally or inspirationally based. In addition to our regular Ice cream we provide a selection of No Sugar added flavors for our customers who have sugar restrictions. In addition to our homemade ice cream we serve a soft serve frozen yogurt that is custom blended to order. We take a Nonfat Chocolate or Vanilla base that we make in our shop and combine them with fresh fruits, candies and cakes in our blending machine to produce a creamy soft serve yogurt in a variety of fresh flavors. Flavor combinations are limited only by your imagination. All ingredients can be blended with Chocolate or Vanilla Nonfat Yogurt. We use fresh fruit and the actual candies and cakes as blend-ins. No artificial flavors. Ice Cream is and and always will be our core product and we have been making it for over 20 years. As the years passed we noticed that many of our customers were unable to eat our signature product due to dietary restrictions and or life style choices. Over the past couple of years we have worked hard to come up with a product that would satisfy these customers. So in addition to our fresh fruit sorbets we now make Non Dairy Vegan Ice Cream from Coconut Cream and or Soy based product. We want as many people in your family to share in our Ice Cream and now they can. We are constantly striving to develop new Non Dairy flavors. It’s a work in progress. Soft Serve Ice Cream in Vanilla - Chocolate - Twist. These are delicious alternatives if you haven't been able to eat soft serve ice cream because of your diet. Welcome to the world of softee! In addition to our non Dairy Ice Cream we also feature our slightly sweet, refreshingly tart Sorbets. Made with no dairy they are the perfect taste for a hot summer afternoon. We also feature a number of Summer Coolers that are made with our sorbets as a base and combined with fresh fruit and seltzer to make a wonderfully refreshing drink. Do you want a special treat for your next birthday party, anniversary or any special occasion? If you want to treat someone spur of the moment we have many cakes available in the shop every day and our "custom" cakes in flavors of your choice with 72 hours notice. They come in 3 sizes, small (6"- serves 2 to 6) (8" serves 6 to 10) (10" serves 10 to 16). We can also make a sheet cake serving up to 24 guests. 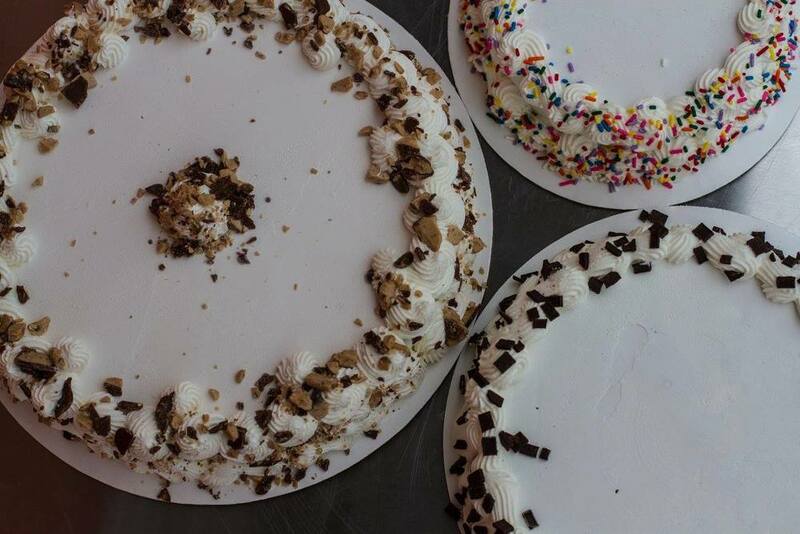 Custom cakes can be made with any two of our flavors and a center filling with any of our toppings. We will decorate our standard in house cakes or the custom made cakes with the events and names of those being honored. Have a special event coming up? Stop in and order a cake today!